I'm currently sitting in the DFW airport bored out of my mind. The last few days have been full of meetings of which all were very good. It seems almost everyone I met here in Texas is a skier and had great stories. They usually involved a lift unloading mishap or an incredible crash. It's always fun sharing those stories. It perplexes me that a state with no snow has such a high population of skiers! Here are a few pictures of the trip. 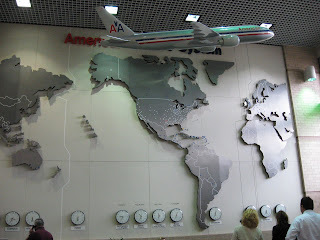 This is the lobby at American Airlines headquarters. 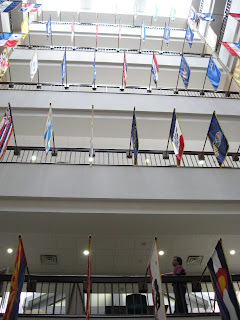 They have a flag of every country in the world! We got a tour of their training facilities. 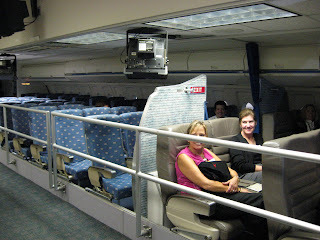 This is one of the simulators where flight attendants train. 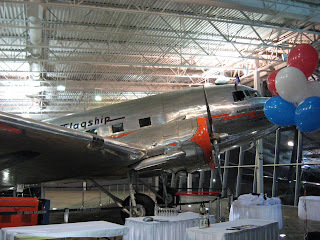 Last night the Grand Junction Visitor & Convention Bureau hosted this reception at the flight museum. I don't know what year this plane is from but it's old and very cool....except it smelled like feet inside. And here is your history lesson for the day. This is the building where President Kennedy was shot from. 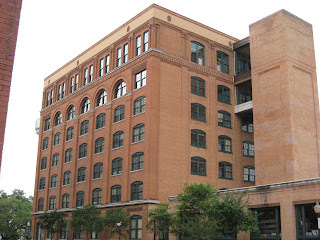 Unless you think there was a second gunman on the grassy knoll...that is to the left of the building.